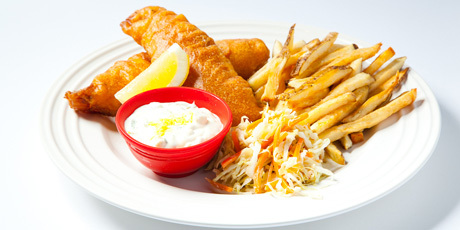 Classic beer better fish and chips served with homemade tartar sauce. You might also like these Incredible Must-Try Recipes with Beer. 3 russet potatoes, cut 1/6"
1. Season the fish with salt and pepper. Combine dry ingredients in a bowl. Pour in beer and whisk together (lumps are okay). Dredge the fish in flour and then place in the batter – fish must be floured first for it to take to the batter. In a pan, oil should be heated at around 350. Slowly place fish into the pan and leave for roughly 5 to 6 minutes on each side or until both sides are golden brown. 1. Put the cut fries in cold, running water and run until the water is clear and not murky. Then, strain the fries and heat the oil to about 325. Blanche the fries until bubbles start to form on the outer layer of each one. Remove from oil and let cool. Then, heat oil to 375. Return fries to the oil and cook until crispy golden brown. Remove and season with sea salt.